Sai Baba's leelas with Kushabhav contnues. Kusha bhav's spiritual journey thus started with Sai Baba in Shirdi. He was strict in following certain religious rules. Every Thursday he used to eat just once. On purnima (full moon day) he would not eat unless having the darshan of the moon. On agyarash he would eat just the fruits. Kusha bhav had leaved the occult powers as directed by Sai Baba, but he was blessed with a special power that of producing sacred Udi of Dhuni of Dwarkamai, from his bare hands just by remembering Sai Baba's name and raising his palms upwards. This happened on a Ekadasi day. Once on Ekadashi day Kusha bhav was sitting by the side of Sai Baba. Sai Baba, 'Do you know the meaning of Upavas? Kusha, 'Ekadashi vratt means spending eating only the kandmul (plant roots eaten as vegetables or food). Saibaba, 'Are onions not the kandmul too?, are they not the produce of God? Saying so Sai Baba took some onions and gave them to Kusha bhav for eating them. Sai Baba ate one onion seeing this Kusha bhav ate one. Sai Baba then clapped his hands and began to make fun of Kusha bhav. He said, 'Look this brahmaniya (slang form of Brahmin). Kusha bhav in the defense began to say that he ate it only after Sai Baba ate. 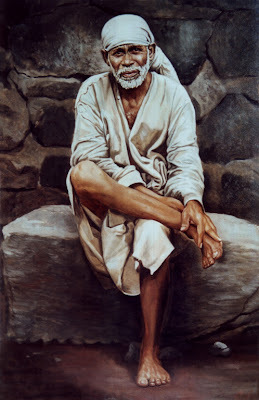 To this Sai Baba by said that He had not eaten the onions. Saying so He vomited, it was seen that Sai Baba has miraculously produced sweet potatoes from His mouth. Kusha Bhav pounced at the vomit and ate it. Looking at this Sai Baba got enraged and abused him and beat him. 'Kusha Bhav in is interview in the book 'The Immortal Fakir of Shirdi' says " I did not mind all in the least, as I was overjoyed at having got His uchchishta as prasad. I knew also that as with Akkalkot Maharaj, so with Sai Baba, His beating and abuse were auspicious and beneficial. If Sai Baba kissed a man and send him off, as He did sometimes, that was not auspicious. Sai Baba's rage cooled down soon. He became calm blessed Kusha Bhav by lovingly putting His hand on Kusha Bhav and he will have now power by putting his palms raised and remember Him, and the sacred udi will flows through his arms. related post parable of onion.